Dr. LaSalle graduated from Otterbein University with honors in 2002. She then attended The Ohio State University College of Optometry. 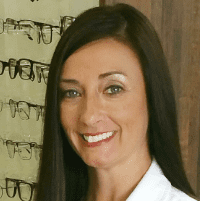 Dr. LaSalle graduated in 2006 and was selected as a member of the Beta Sigma Kappa International Optometric Honor Society. Dr. LaSalle completed an ocular disease externship; along with training in pediatrics, low vision, biocular vision, and contact lens. Dr. LaSalle is a member of the American Optometric Association. She is also an InfantSEE provider, providing free eye exams for infants 6 months to 12 months. Dr. LaSalle is certified by the National Board of Examiners in Optometry and the South Carolina Board of Examiners in Optometry. She performs comprehensive eye examinations including the diagnosis, treatment, and management of eye disease and contact lens examinations.